Hectic workloads, a never-ending to-do list and traffic that never seems to die down—it seems like we get busier by the day. While I’m still waiting for the invention of the time machine so I can go back to simpler days, I recently found some comfort in a new restaurant off Ben Hur Road. Hwy 55 Burgers Shakes & Fries, a ’50s-themed diner, supplies the golden-age vibes and traditional diner delights that had me imagining I was living in a totally different decade. Hwy 55 is a North Carolina eatery with locations up and down the East Coast. This is the first Louisiana location for the popular chain, which dishes up classic American favorites cooked in an open-grill kitchen. 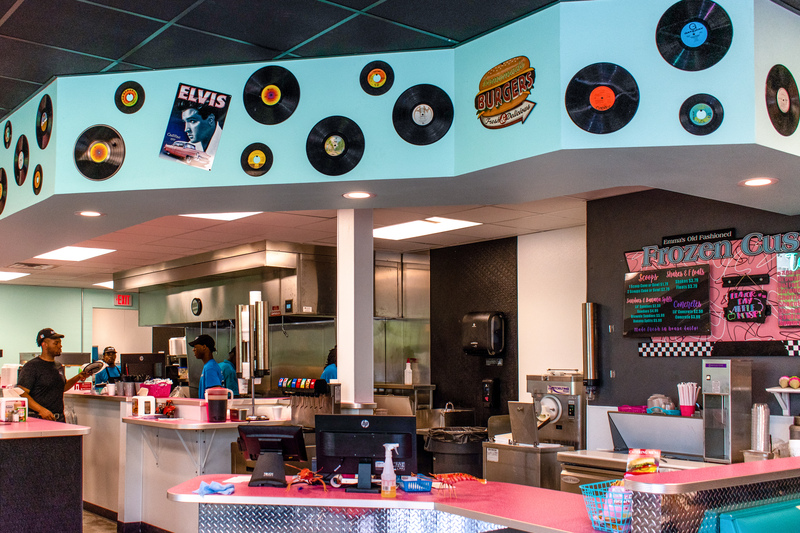 Inside the Baton Rouge diner, bright walls and retro memorabilia are a perfect match for the lively throwback tunes blaring over the speakers. 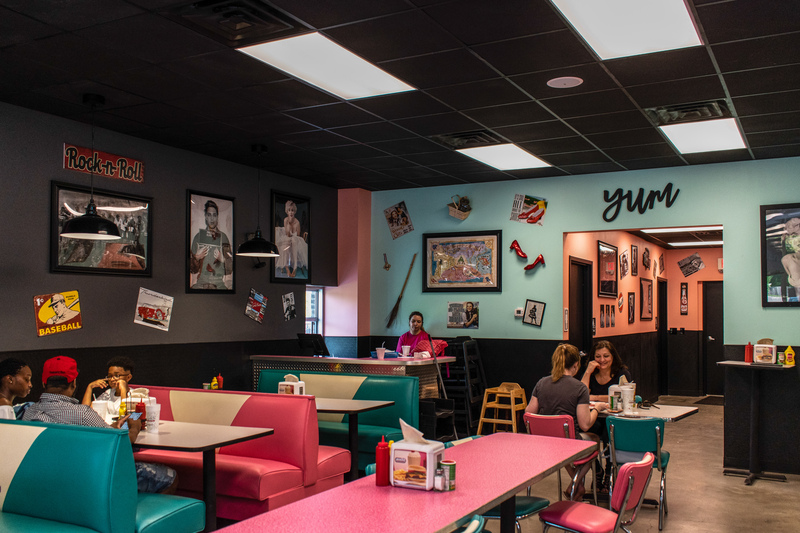 The old-school vibe is completed by large vinyl booths in shades of teal and bubblegum, tabletops with that retro chrome detailing, as well as an open kitchen where diners can watch the cooks blending shakes and plating sandwiches. While burgers are Hwy 55’s main specialty, I was feeling adventurous on my visit and wanted to try something less expected. 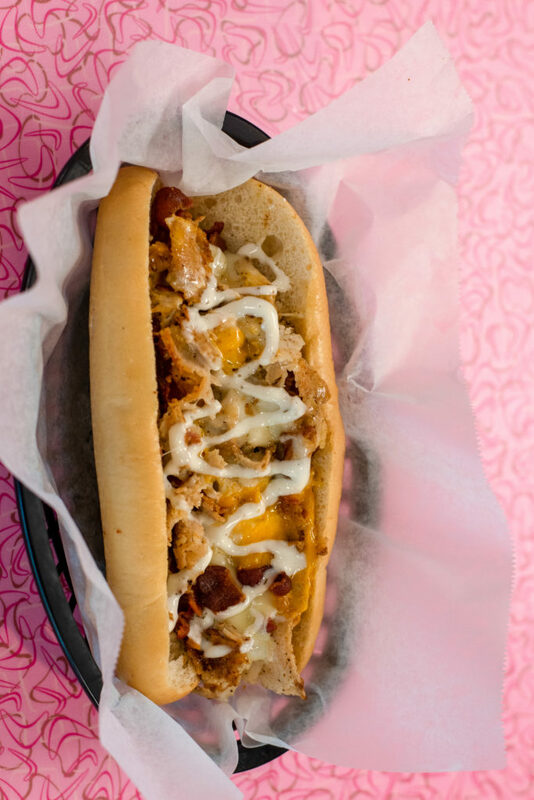 I opted for The Moose, a cheesesteak-style sandwich with chicken, bacon, ranch and two different kinds of cheeses. With the warm and melty flavors of the cheese and the rich meats, this sandwich tasted like home to me. Great comfort food. 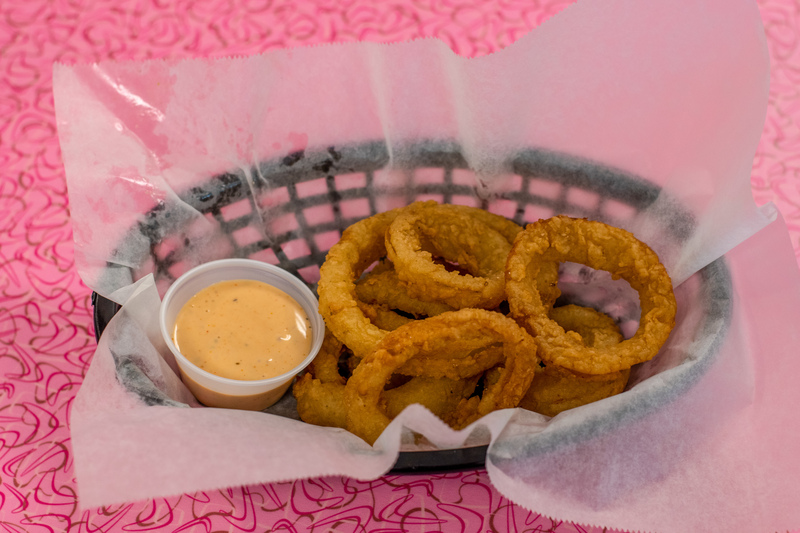 I chose onion rings as my side—the perfect combination of tangy onions and a savory and salty finish on the breading. I washed the bountiful meal down with a vanilla shake with M&Ms, and wow, was it a perfect ending to my meal. The custard shake was thick and creamy with just the right level of liquid to slurp from a straw. Perhaps the best part of my entire meal, though, was the price. I only spent a couple bucks, which was way less than I was expecting for the amount of food I ordered. 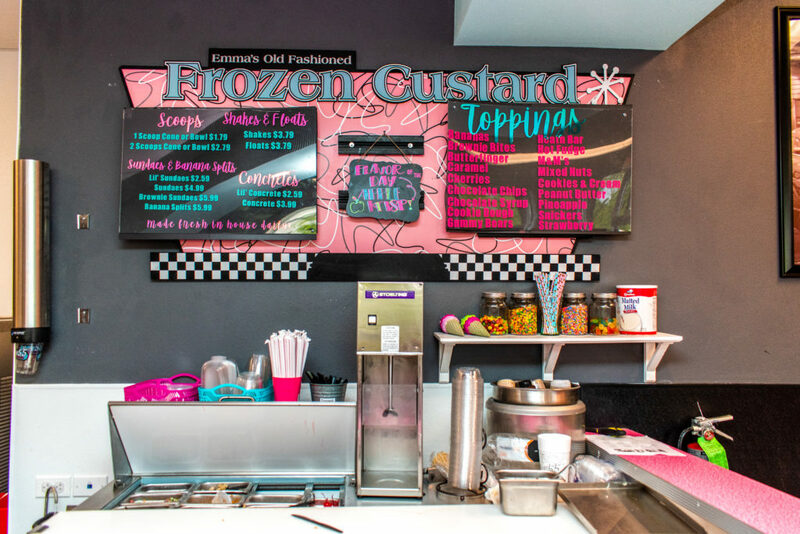 The restaurant’s pricing is fitting for its location, which is overflowing with nearby college students interested in trying new food but on a budget. That said, I thought Hwy 55 was a great spot for diners of all ages to sit back and relax while remembering the days of sock hops, jukeboxes and rock ‘n’ roll. 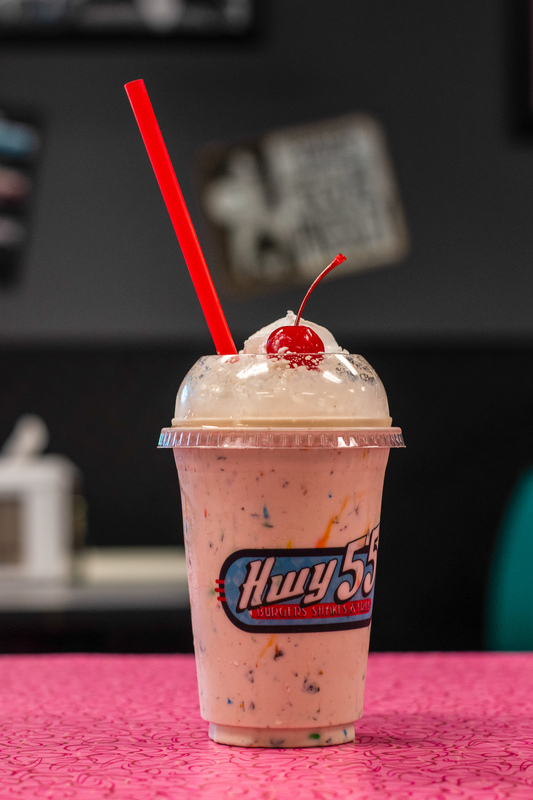 Hwy 55 Burgers Shakes & Fries is at 411 Ben Hur Road. It is open 11 a.m.-10 p.m. Sunday through Thursday and 11 a.m.-11 p.m. Friday and Saturday.